It can be seen from historical details that the name has its primary origins as an association of someone from Repton in Derbyshire, which was anciently called Repington. Referring to the maps above though it is very clear though that specifically the Rippington family is a 'Home-Counties' phenomenon and the historically documented Repington family is quite different, being titled, appearing in Burke's Peerage (click on the Repington Family Crest below for more details), historically owners of Amington Hall in Tamworth and has much closer origins with Repton. Recent research has found documentary evidence that indicates a very distinctive reason for the differentiation between Repington and Rippington ... although both names have their origins in Repton, it seems that it was who was using the name that made the difference in pronunciation and spelling. It appear that Rippington is derived from the name that the Latinate monks of Repton Priory used - as in the Priory of Rypyngdon and the Parysshe Church of Rypyngdon ... also written as Rypingdon. 38. Thomas Thacker. Grant in fee, for 648l. 11s. 8d., of the house and site of the late priory of Rypingdon alias Repton, Derb., with lands (specified) in Repton and Staunton which were kept in the prior's own hands, and certain other lands and woods (names and extents given) in Repton parish. - as in Simon de Repington (and hence the recorded history of the Repington family and it's direct association with Repton) ... these are much earlier versions of the town's name than the Latin Rypyngdon as used by the Priory. 6. John Yong, the prior, and the convent of Holy Trinity, Rypyngdon, Derb. Licence to alienate the manor of Graundesden Magna and lands in Graundesden Magna, Hardewyke, and Leycotte, Hunts; Sutton Bonyngton, Notts; and Westleyke and Estleyke, Notts; with the advowsons of the churches of Westleyke and Estleyke and lands in Donesthorpe, Derb. ; and the advowson of the vicarage of the church of Magna Badowe, Essex; to Sir Fran. Brian, Sir John Porte, Sir Geo. Gresley, and Hen. Audeley, their heirs and assigns for ever. Del. Westm., 4 Jan. Vacated because inrolled on the fifth part of patent roll 29 Hen. VIII. [See Vol. XIII. Pt. I. 190 (7)]. Pat. 30 Hen. VIII. p. 2, m. 2. Graundesden Magna is of course Great Gransden and this particular document details the transfer of the Priory's land to Henry Audley et al. as explained on the Rippington Manor page. As detailed in the 1547 document above, Thomas Thacker acquired the ex-Priory buildings at Repton, and these were subsequently inherited by his son, Gilbert. - “to destroy the nest for fear the birds should nest there again”. What is interesting to investigate is the chronological progression of both surnames from their medieval spelling to their modern-day forms. In Middle English (1154–1470) Y became identical to I - therefore, many words that originally had I were spelled with Y, and vice-versa. After 1470 Chancery Standard English was used for most official purposes except by the Church, which used Latin. The chronological charts shown below document the progression of each surname from Repyngdon to Repington and Rypyngton to Rippington, although when the latter had previously changed from Rypngdon to Rypyngton is the most interesting unknown and would clearly answer the question as to the true familial origin of all Rippingtons. The two charts show the progression of the surnames over the centuries from their 'Y' laden origins to their present day forms. It's interesting to see that both surnames first took on their modern spellings at almost exactly the same time - Repington in 1557 and Rippington in 1564. Queen Elizabeth I came on the throne in 1558; so after all the religious chaos that had ensued during her predecessor Henry VIII's reign (i.e. the Reformation), it may simply be that for both families anything that looked like it had a religious association, particularly anything Catholic or Latin was frowned upon. One clear difference is that the peerage records allow the tracing of the Repington surname all the way back to the 11th century, but the earliest record found so far for a Rypyngton is 1431. Considering all these details the question that needed answering is why did it take until 1431 for the Rippingtons to appear in the records? One source of differentiation in the names could have been association with the priory ... was it a member of the Repington family that was in some way ecclesiastical? or was it an unrelated family that had a strong association with the lands around Great Gransden? - the Alumni Oxonienses lists entirely Repingtons. Cambridge University's Alumni Cantabrigienses lists entirely Rippingtons (with a few dual namings in there at the beginning ... all later copies of these records list the name as Rippington). But more likely it now appears that it was the Lichfield Repingtons who were the prime instigators of the name change from Repyngton to Rypyngton, sometime in the early 1400s - it was their close association with London and the home counties, when it appears that maybe their Midlands accent made Repyngton sound like Rypyngton ... or possibly it could have been that Rypyngton sounded more 'Urban' and modern at that time. More than just the name change though, mounting evidence is now being found that it was this actual family that are the actual progenitors for all the Rippington families; as quite a number of them have now been found to have had direct associations with locations within a few miles of where the Chiltern Rippingtons are to be found in Tring just a few decades later in 1548, and also the City of London Rippingtons in 1472. William Repyngton, Armigeri (now suspected to be the William Rypyngton recorded in 1431) had land associations in Buckinghamshire with the MP of Buckinghamshire; John Hammeden of Kymbel (Kymbel being an early name for Great Kimble). He was also associated with Sir Robert Whittingham - a very prominent MP and London merchant. Thomas Repyngton, William's grandson, made the move from Lichfield to London in 1498. Ambrose Rippington / Repyngton moved from Lichfield to Buckinghamshire in around 1474. Ralph Repington was born in Drayton Beauchamp (2 miles from Tring) in 1522. William Repyngton owned Wadlowes Manor in Toddington (15 miles from Tring) in 1564. The names Repington and Rippington have frequently been interposed though - two significant early members of the Repington family were Dean Ralph Repyngdon - a religious contemporary of John Wycliffe (1328-1384) and Bishop Philip Repyngdon who followed in Wycliffe's footsteps (1345-1424) ... more than one archive document refers to these two as Ralph Rippington and Philip Rippington. Another complication in this name differentiation has been that just before the beginning of the 19th century (approx. 1780) many Repingtons changed their name to Rippington - Parish records in areas that had previously only shown Repington (or Reppington) baptisms suddenly start showing Rippingtons .... and in some instances even within the same parental family. It's well documented that the peerage Repington family were well known and were getting quite a reputation for themselves - one gentleman of their family being referred to as a 'Wag' in the popular press at the time. Maybe the association with the Repington name wasn't always favorable(?). This situation didn't always persist though, as there's one familial example where they changed their name back to Repington in later generations. But we still do now have instances where living Rippington descendants have Repington origins and these are detailed below. 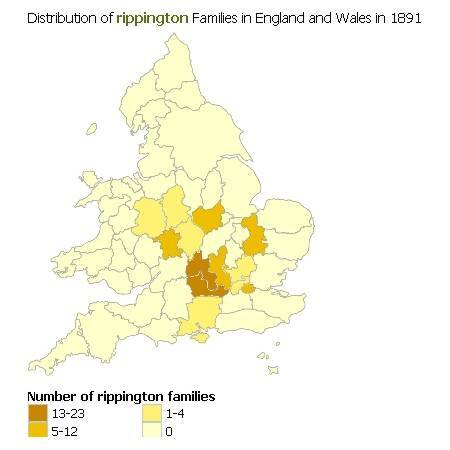 Getting back to the Rippington distribution map above it seems that there are various clusters of this family and with this in mind let's try and understand where all the various members came from. Firstly with my personal family root from Princes Risborough - these seem to be part of a group that I'll refer jointly as the Chiltern Rippingtons (from the Chiltern hills in Buckinghamshire). 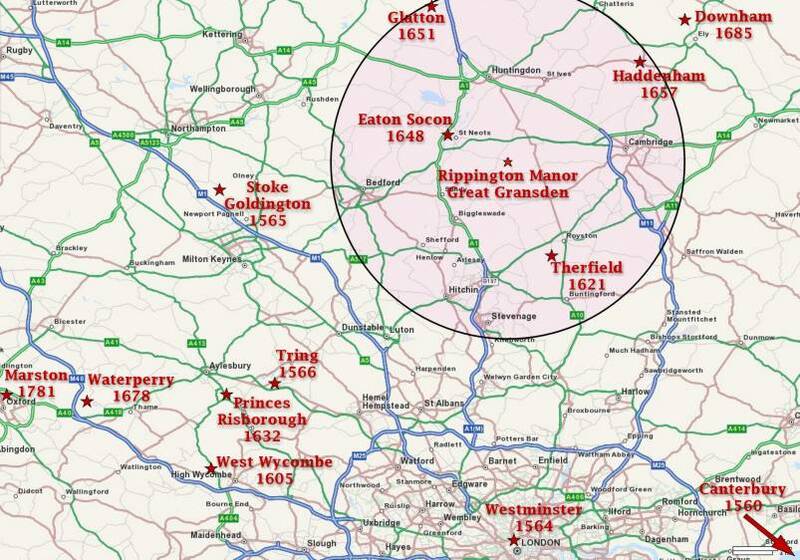 The Chiltern Rippingtons came out from West Wycombe in 1605 and it's looking highly likely that they can be linked backed to earlier (1566) families in Tring, Hertfordshire. An early branch of the Chiltern Rippingtons moved a few miles west and formed one of the more wealthy family groups - the Oxford Rippingtons, which in turn produced one of the most well documented families - the Marston Rippingtons. This family group settled in Marston (now a suburb of Oxford) from around 1801 and became major Farmer Landowners in the area, even having a couple of roads named after them - Rippington Drive (Oxford OX3) and Rippington Court in Sutton Wick, Drayton. At the same time other members of these families also owned a variety of butcher shops in the west end of London. A group of Rippingtons appeared in London in the early 16th century. Although originally this had been thought to be just one group, further research has shown that there were two distinct main clusters - one in the City of London and another in Westminster. The reason why these familial locations are now considered to be separate is that at this time in history Westminster was outside the City of London; being connected to it only by a country road. The family in Westminster appear in the parish records for St. Margaret's Church, which stands between Westminster Abbey and the then Westminster Palace - a highly salubrious location. Westminster Palace later became the Houses of Parliament, and St. Margaret's Church has commonly been called 'the parish church of the House of Commons'. One branch of the family had been a little difficult to explain - the Historical Kent Rippingtons - the earliest parish records shows an 'Elizabeth Rippington' being married in Canterbury in 1560, and not long after this that there are numerous Rippington births in the area (obviously there must have also been male ancestors around here at the same time). It's now been shown that all these families (most likely) came from the City of London Rippingtons - Elizabeth looks like being Elsabeth Ryppyngton and Roger Rippington has been documented working for Sir William Herbert, the 1st Earl of Pembroke in London and then moving to the Earl's other house in Faversham, Kent. Another major group of the family that has persisted to the present day is the Sussex Rippingtons - appearing at West Hoathly in about 1639. In a sense the later families in this group ought not be called Rippingtons, as Ann Maria Rippington from Sedlescombe didn't marry her son's Father Robert Crisford. 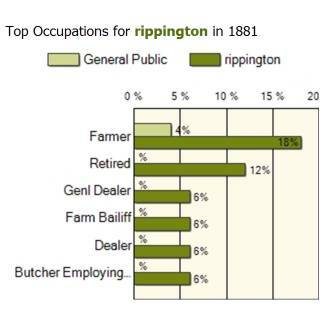 It looks like Robert could have been fairly wealthy, which he seems to have endowed upon his son John Crisford Rippington. John traveled the country as a Journeyman Miller, doing very well for himself and subsequently his descendants moved into wealthy Knightsbridge. One of these, Sidney Thomas Rippington, travelled even further and moved to Canada. - John Walter Rippington, a descendent of the Oxford Rippingtons. Obviously these family migrations didn't happen overnight, they mostly occurred over numerous generations as families slowly moved from village to village ... although obviously on occasions it did take just one individual to up-roots and move to a completely new area. William Christopher Rippington (b. 1852) was one such individual in my own branch of the family who did just that - leaving behind his impoverished family in Hertfordshire to find his fortune in the horse-racing industry in Newmarket (shame it never really happened). Reasons for these family relocations were, as today, very various - workers looking for employment, farmers looking for more land, young men and women meeting partners from other areas, escaping family feuds ... and many more reasons. 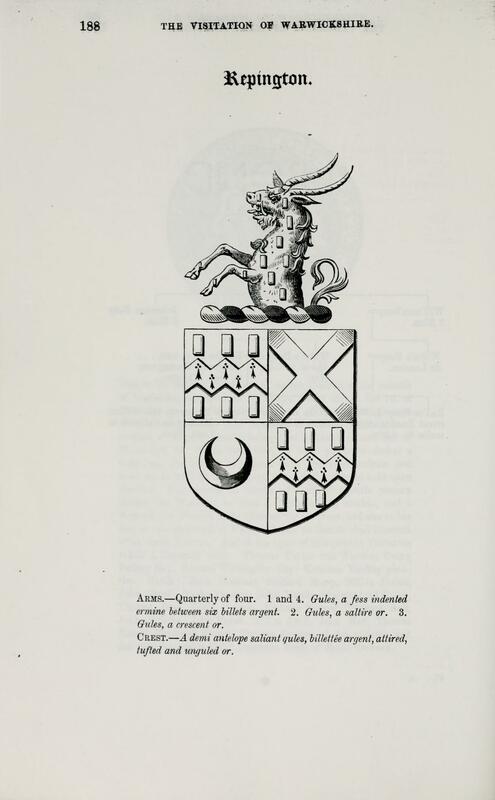 ARMS.—Quarterly of four. 1 and 4. Gules, a fess indented ermine between six billets argent. 2. Gules, a saltire or. 3. Gules, a crescent or. CREST.—A demi antelope salient gules, billellée argent, attired, Tufted and unguled or. The family motto is Virtus Propter Se - "Virtue for its own sake". The dictionaries give propter as "on accout of", or "by reason of", "for the sake of" or "as its own reward" are a little more idiomatic in English. Also, virtus very often denotes a kind of manly excellence rather than "virtue" per se, so "valour" is likely to be a better meaning. "Valour as its own reward". All the children born in this area around and before 1760 were christened Repington (or Reppington), descended from the Warwickshire Repington families (most likely from William Repington born in 1699 in Kingsbury, Tamworth) ... those in the next generation around 1780 were variously christened Reppington or Rippington ... and the 1800s families curiously became all Rippingtons(?). So that the family of Benjamin Rippington (b. 1803), later to be found in Littlethorpe in Leicestershire, are not related to any of the other Rippingtons on this family tree. - John Rippington (b. 1828), originally these children were thought to be true Rippingtons, born in Ireland to an emigrant Rippington father .... but detailed subsequent research now suggests that they're much more likely to be descended from the Repington family ... with John even being shown as John Reppington on one document associated with him. So in conclusion, this is the story so far - there are about 125 living Rippingtons on the electoral roll in this country (that includes any partners with the name Rippington) ... plus about 20 or so children and around another 20 overseas. I've found only around 700 people, ever, who've been born with the Rippington surname. - a Thomas Rippington born in 1587 ... his existence is quite real - as you'll see we've even got a copy of his Will .... have a look at the transcription, it makes interesting reading. I made that comment at the beginning of 2011 - subsequently I've found out quite a bit more about the scope of this family and also the many descendants of those married and now with new surnames, who are obviously very proud to be associated with the Rippington name. Thanks must also be extended to Polly Holmes Ã Court for all her research into the Repington family history, including family portraits shown on this web site.